Function: The Missouri Western State University Board of Governors establishes policies, by-laws, rules and regulations for its own government and for control and government of the University; to select, appoint, and remove a President of the University; to set admission standards; and to make decisions on financial matters. Geographic Requirements: No more than four voting members shall be of the same political party. No more than three voting members shall be residents of the same county. 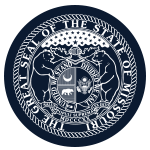 Two voting members shall be residents of counties in Missouri other than the five county statutory service region of Buchanan, Andrew, Platte, Dekalb, and Clinton Counties.